VdB 124 (also catalogued as IC 1287, Ced 163, DG 154, LBN 75 and Magakian 773) is a reflection nebula in the constellation Scutum. Its illuminating star is the 5.5 mag. 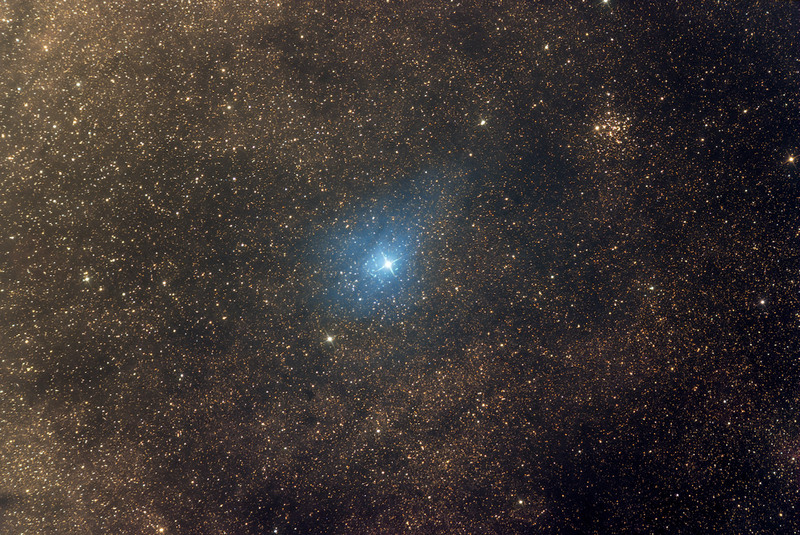 HD 170740 from spectral class B2V. The paralax measurements place the complex at about 700 light years away. At the upper right corner is the open cluster NGC 6649. Discovered by John Hershel in 1835, it has a visual magnitude of 8.9 and angular diameter of 6'. Two Sharpless nebulae can also be spotted on the image (Sh2-55 and Sh2-56, see mouseover).